The Itty Bitty Kitty Committee: Bring on the Squillions! Today's the day, friends! We're officially kicking off FUNdraising season!! Team Itty Bitty Kitty Committee, for the ninth consecutive year, is participating in Dog-A-Thon, The Humane Society for Tacoma and Pierce County's fundraising walk for homeless pets. For those of you who are new to the blog, I think you're going to be surprised by how fun this fundraiser is. It's a really exciting time of year at the IBKC, and so many look forward to this event. During the next three weeks, we will all work very hard raising funds for our shelter, and we will have a great time doing it. We will talk about all of the positive and wonderful things our Humane Society is doing. You'll hear lots of feel-good stories about the cats we have helped. We want to keep you entertained while we're pestering everyone for donations, so you'll see lots of extra posts and pictures during this stretch. We keep it all very light and try to make it as painless as possibles for all of you! During this season, you'll see the whole IBKC community rise to support our shelter. You'll witness lots of very kind, generous, and caring kitty-loving people in action. You'll see some pretty magical moments. You'll cheer (and breath a huge sigh of relief) when we meet our many matching donation challenges. It will make you feel warm and fuzzy, and you might just even cry a few happy tears. I know I always do. You'll see some tense moments -- it can be a nail-biter at times -- but I promise you that in the end, you will always feel uplifted. Seeing so much good can't be anything but positive. And gosh, with all that's going on in our World right now, don't we need a little more positive? Even though this event is called "DOG"-A-Thon, because we're all about the cats and kittens around here, all of the money we raise goes directly towards helping our feline friends. EVERY single cent of it! This money will help life-saving projects and programs -- like our foster program. It will help make shelter improvements for the cats. It will buy cuddly beds, toys, scratchers, litter boxes, and cubbies to help make a cat's stay at the shelter more comfortable. It will help reduce the cost of spay and neuter surgeries for pets of lower income families. It will help fill the shelves of the Emergency Pet Food Bank with cat food. It will help fix and vaccinate the feral and free-roaming cats in our community. It will help lost kitties get reunited with their owners. It will fill bellies with nutritious food. 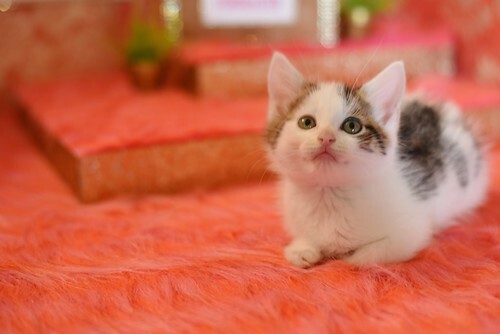 It will provide medical care for tiny kittens, adult, senior, and special need cats. It will help make cats healthier and happier while they wait to meet their forever families. It will help save lives. Many lives. This year, I've set our goal at $100,000. It's a huge amount, but we've set this goal before and have exceeded it every time. It's going to take some hard work to get there, but I have a lot of faith in our community, and I know we can do it. I just know we can! In all of these years of fundraising, this little community of ours has donated over $750,000 to help homeless cats and kittens. Can you believe we did that? The Humane Society has put our donations to good use, and I've seen so many positive changes happen for the cats at the shelter because of our community. WE came together and provided them with the resources to make wonderful things happen. We've helped them help more cats. I am so proud of us! So, what can we expect this season? There's lots of great stuff on the calendar, and I'll be adding more as we go.We'll have lots of auctions this year. Once our current crew graduates, we'll bring in the next batch of babies and auction off the rights to name those kittens. I also have a very lovely cat-themed quilt that a couple of special people made just for this occasion -- I am so excited to reveal it! We'll be auctioning off some art and other cat-related items, too. We will be auctioning off the always popular "Tea with the Bean" --- your opportunity to have lunch with us at IBKC headquarters and meet Charlene, Wylla, and kittens. The tea has been a huge success over the years, so of course, we'll do it again. Even if you don't toss your hat in the ring, it's exciting to watch the bidding frenzy! We will be checking in on some of our IBKC grads, and I'll be posting lots of alumni updates, too! Thanks to some very generous folks, we will have MANY awesome matching donation challenges to help us read our goal. There's still room on the schedule for more, so if you would like to offer up a match, please send me an email, and we can discuss the details. We'll have days dedicated to some of your favorite programs and causes: The Senior Cat Medical Fund, Community Cats, Special Need Cats, The Emergency Pet Food Bank, the Foster Program and our Low-Cost Spay and Neuter program. It's a great way to give and have your money go directly towards something you really care about. The HS is using trying a new online fundraising platform for Dog-A-Thon, so things look a little bit different this year. The new platform is pretty straightforward and easy to navigate, so I don't think anyone will have issues. But if you do, please let me know. It doesn't have a few features the old system had, but I'm working hard with my techy husband to find ways to provide some of the things that are missing. The big thing is getting a "progress bar" up on the blog. Hopefully, we'll get that resolved today! In the meantime, you can track our progress on the fundraising page --- maybe even "bookmark" it for your convenience, so it's easy to follow along. Another thing that's a little different this year is that sadly, I won't be able to walk the Dog-A-Thon walk. I've got a family wedding in Colorado happening that very same day, so I have to miss it the event. I can't tell you how heartbroken I am over this -- it makes me so sad that I can't be there to celebrate our victory and the Humane Society, too. I haven't broken the news to Wylla yet, who always joins us for the walk. I know she'll be disappointed and sad to let down her adoring fans. I am SO SORRY we can't be there. Normally, we wrap up the fundraising the day before the Dog-A-Thon walk, but because of my traveling, we'll be ending it a couple of days earlier on Wednesday, July 19th. We wanted to have a really awesome first day, so we're starting this show with a huge $5000 matching donation challenge. Our Awesome Anonymous Donor is back this year, and she will be matching every single dollar we donate today until we reach the $5000 cap. I know it's a big challenge to meet on our very first day, but to hit our big goal, we're going to have to keep things going a pretty good clip. It's going to take big matches like this along the way to get us there! For every dollar we give, our Awesome Anonymous Donor will do the same until we hit the $5000 max. SO, if we're able to meet the match, our $5000 will turn into $10,000! Of course, even if we don't complete the match, our dollars will still be doubled, but when someone offers up a challenge, we hate to leave a single dollar on the table, so we work hard to max it out. To jump in on this match, get your dollars doubled by our donor, and make a tax-deductible donation to our campaign, please visit our FUNdraising page. This matching donation challenge ends at 7:00 PM (Pacific Time) tonight. Thank you Awesome Anonymous Donor for this very generous match to kick things off! Our shelter has provided us with so many wonderful kittens over the years. These kittens have made us smile, they've brightened many days, they've warmed our hearts -- especially during these troubling times. Here's our chance to give something back - we can honor all those itty-bitty kitties and say "thanks" by supporting the organization that gave them their start in life - The Humane Society for Tacoma and Pierce County. Thank you for listening, friends. It will be an exciting and emotional stretch, and I can hardly wait to see how much we can raise to improve the lives of our precious shelter cats and kittens. We appreciate every dollar you give! No matter what the size of the donation, it helps because when we put it all together, we make BIG things happen for our little friends. 100 Squillion! HERE WE COME!! OK, I'll be back with lots more today! As I mentioned before, I post a lot during the FUNdriaser, so do stay close! We've got LOTS of cuteness coming your way!!! THANK YOU for being here. Thank you for caring. We love you!! Wheeeeeee! Here we go!!!!! OK, Robin! You've got the fist shift on the phones, are you ready? Yoohooo, Robin, are you ready? Don't worry, blog land. I've got this. Please click HERE to learn a little bit more about Dog-A-Thon and make your donation! PS I know that not everyone is in a position to make a donation - you can always help by spreading the word! Sharing on Facebook, Twitter or via email doesn't cost a cent, and it helps tremendously! Thanks!!! None better to man the phones on the first day. Good luck Robin, we know you got this. Looking forward to watching what everyone does together to help the kitties -- the progress to date, thanks to Laurie and the IBKC, has been incredible! Oh, you are so funny! But Robin will surely draw in quite a parade of starting donations. Who could resist??? There is no way to write a note- like "in honor of", etc, or "for the kitties!" - on the donation form. I hope that gets to be corrected since those notes were fun to read. I love FUNdraising time each year. 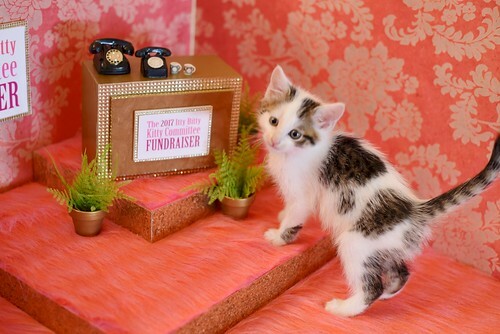 The kittens always end up doing a great job manning the phones, even if some do have a bit of a rough start. ;) I have no doubts whatsoever we'll reach (and probably exceed) $100 squillion. Donated today in honor of Bart Mittenfloss in hopes that every itty bitty kitty gets as wonderful a home as he did. Robin is doing a great job at the phones!